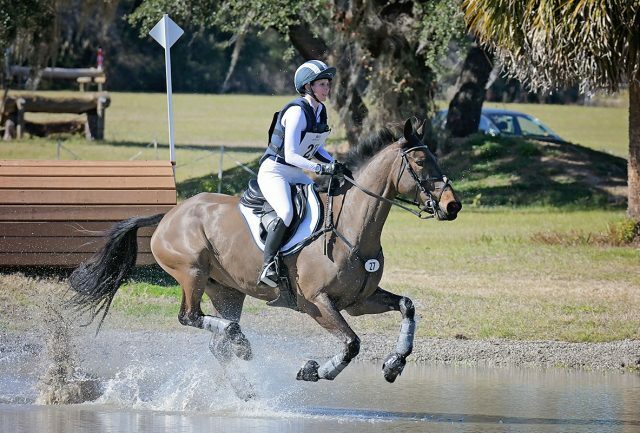 Is your horse truly fit enough for cross country? I decided to take the guesswork out of my horse’s fitness plan by using a heart-rate monitor. Photo by Xpress Foto. Studies show that once a horse’s heart rate reaches 150 beats per minute, his muscles slowly start to produce lactic acid, which ultimately creates fatigue. Once a horse’s heart rate reaches 175 to 180 bpm, or 80% of his maximum heart rate, the lactic acid levels spike sharply. It’s critical for event horses to train under these conditions so they can power through that lactic acid production on cross country. Eventers have long understood this basic principle, which is why we include galloping in our horse’s fitness schedules. But how can you know if your horse is actually reaching and ultimately staying in the target zone when lactic acid production occurs for the required amount of time to guarantee proper conditioning? The answer is simple — train with an equine heart-rate monitor, track your horse’s heart rate and adjust his fitness plan accordingly. If you’ve never used a heart-rate monitor before, it might seem like a daunting prospect to incorporate one into your everyday routine, but a new company called Hylofit is making it easier than ever. Setting up Hylofit is super easy and only takes a few minutes. I had never used a heart-rate monitor prior to using Hylofit, but I didn’t have any issues following the step-by-step guide. Once you attach the heart-rate monitor to your horse’s girth, all you need to do is sync it to the Hylofit app on your phone, get on and go. 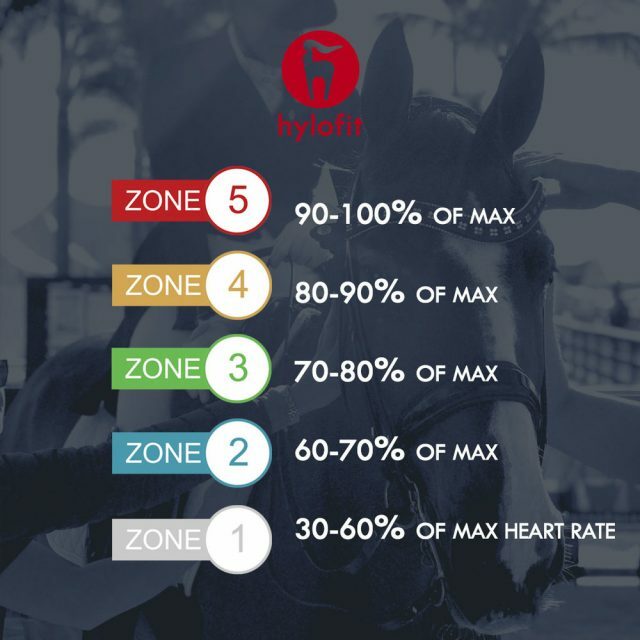 Hylofit also provides you with a guide to zone training to help you develop your horse’s fitness plan, which is super helpful in taking the guesswork out of the process for newbies like me who have never used a heart-rate monitor. Zone 1 is up to 60% of the horse’s maximum heart rate. This is a very light intensity effort level — think warming up, cooling down and hacking. Zone 2 is up to 60-70% of the horse’s maximum heart rate. This is a light intensity effort level used for strengthening and conditioning, like trot sets. Zone 3 is 70-80% of the horse’s maximum heart rate. This is a moderate intensity effort level where you can hear the horse’s breathing begin to increase. Training in this zone builds stamina. Zone 4 is 80-90% of the horse’s maximum heart rate. This is the zone in which lactic acid production begins to occur. Zone 5 is 90-100% of the horse’s maximum heart rate. This is the zone your horse will reach when running cross country at a competition. Hylofit can also sync to an Apple Watch. Hylofit tracks the time your horse’s heart rate stays in each zone during your rides, so you can monitor fitness gains and losses over time and make smart decisions about how to tailor your horse’s fitness schedule. After your ride, you can review all the data and analytics on your phone or on the Hylofit website. As a newcomer to training with a heart-rate monitor, I’m excited to be using Hylofit as I aim for my first CCI2*-L (formerly CCI*) this year with my horse, Imperial Striker, better known as Derry. I’ll be sharing our results here on EN as we both get fit together. 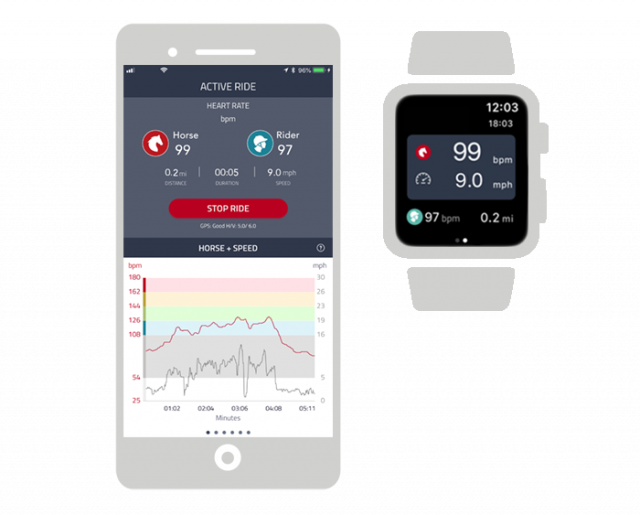 Yes, Hylofit also tracks heart rate and fitness for riders! Click here to read more about using a heart-rate monitor to better understand your horse’s fitness. Hylofit also has a number of fantastic educational articles on their website. Stay tuned for my next blog sharing my results.